Toward the end of Guillaume’s arguments (Béguin, Guillaume, Roy, 1985, 9-43) supporting his reconstruction of the architecture of the destroyed Gallery of Ulysses at Fontainebleau he wrote: “Comme on l’a fait pour le premier escalier de la tour Ovale [A.2], nous sommes tentés d’attribuer à Rosso… la paternité de ce projet…. Tout indique que Rosso – associé à Primaticcio? – a conseillé le roi en 1536 … l’idée d’une longue galerie voûtée, allant du château au jardin des Pins.” Guillaume, who also mentioned (Béguin, Guillaume, Roy, 1985, 64) 1537 as the year in which Rosso proposed it to the king, related the building of this gallery, which was 155.20 meters long, to the construction of the Pavillon des Poêles, the terrace of which on its south side above the Galerie Basse was at the same level and had the same breadth and alignment as the Gallery of Ulysses. This terrace was one of several that connected various parts of the château, including the Gallery of Francis I, to the Pavillon des Poêles. It was from the terrace on the south side of that pavilion that one entered the Gallery of Ulysses. Guillaume thought that the Pavillon des Poêles was begun in 1536 or 1537 and thus this would also be the date of the beginning of work on the Long Gallery (only later called the Gallery of Ulysses), although the decision to build it would have preceded the building of that pavilion. It is likely, although Guillaume did not say so, that that pavilion was designed by Rosso (L.42). Guillaume argued that according to the plan for the château of 1527 the south wing of the Basse Cour, the wing that became the Gallery of Ulysses, was originally an open gallery at ground level only with a pavilion at each end. (Guillaume supposed that this gallery would have had a pitched roof with dormer windows to match the north wing of the Basse Cour.) It was completed in 1531 and extended as far east as the north wing did, stopping short of the east wing of the Basse Cour by about twenty-one meters.1 But around 1536 the plan for the south wing was changed. The twenty buttresses of its south wall were strengthened, the east pavilion was destroyed, and a new and more solidly built extension was added to link the south wing to the east wing. Thus the gallery was joined to the Pavillon des Poêles, the construction of which would have just begun. The Pavillon des Poêles was set about three meters closer to the center axis of the Basse Cour than the corresponding pavilion to the north. This slight displacement allowed for the gallery comprising the south wing of the Basse Cour to meet the Pavillon des Poêles at its south side so that the width and upper level of the gallery coincided with the width and level of the terrace above the Galerie Basse that flanked the ground level of the Pavillon des Poêles. On top of the reinforced open gallery and its strongly built extension was constructed a pseudo-vaulted gallery that subsequently became known as the Gallery of Ulysses because of the subjects of its much later decoration. From the evidence of Du Cerceau’s plans and views it could be concluded that originally the Pavillon des Poêles was to terminate the south end of the west wing of the château without the Long Gallery attached to it, for this arrangement is what Du Cerceau’s print of the west front shows, even though that print was made many years after the gallery was built. The Galerie Basse is missing from his view possibly because it was an architectural feature that had no function in relation to the west front of the château. When he depicted both the gallery and the pavilion in his views from the south (in his print and in his drawing in the British Museum), Du Cerceau showed an ideal meeting of the corners of the pavilion and the gallery, not the actual arrangement as reconstructed by Guillaume. Guillaume believed that the elongation of the gallery over the corner of the pavilion was the result of an artistic intention to create an entrance bay to the gallery that could receive proper decoration that Rosso would have planned for it. Its interior proportions and decoration could have been a consideration, but it may be reasonable also to suggest that the extension of this room across the front of the adjacent pavilion was necessary, as it would have been impossible to have two such large buildings, the gallery and the pavilion, merely touch at the pointed edges of their corners. They had to be more firmly joined. This led to a disagreeable conjunction that Du Cerceau chose not to record. Guillaume’s attribution of this project to Rosso was also dependent on its relation to the long vaulted upper gallery, three-hundred meters long, of the east wing of the Belvedere of the Vatican, which he believed Rosso would have recalled and recommended to the king as a project to be emulated at Fontainebleau. Guillaume also pointed out that round windows like those on the south side of the Long Gallery were not found in France prior to the arrival of Rosso and Primaticcio in France. Before the arrival of Serlio one finds oculi, Guillaume stated (Béguin, Guillaume, Roy, 1985, 27-28, n. 42), in the Gallery of Francis I, such as the framed round frescoes flanking the Loss of Perpetual Youth (Fig.P.22, II S a). One might add the small round windows above the doors on the south side of the Galerie Basse (Fig.Du Cerceau Print, Gallery), the architecture of which may well be by Rosso. The awkward joining of the Long Gallery and the Pavillon des Poêles, if Guillaume’s reconstruction is correct, seems to me to indicate that the gallery was not foreseen when the pavilion was begun. It may be that what was planned was merely the joining of the original ground level gallery to the pavilion to form with it a long terrace on top of that gallery flanking the garden to the south. Only afterwards was the pseudo-vaulted gallery projected with an entrance from the terrace on the south side of the pavilion. As the time of the beginning of the decoration of the gallery post dates Rosso’s death (see below), there is no way of knowing with certainty that the gallery was built, or its construction even begun, before Rosso died. Nor, for that matter, that it was conceived before he died. Thus the attribution of the project to him loses much of its credibility. However, there still remains the possibility that Guillaume correctly intuited a relationship between the Gallery of Ulysses and Rosso. If Rosso designed the Pavillon des Poêles, as I believe is likely, he would have planned it in relation to the already built open gallery, which would be extended eastward to meet it and form a long terrace above the gallery of the south side of the Basse Cour departing from the terrace above the Galerie Basse. In this case the meeting of the corners of the ground level of the pavilion and the open gallery would not have been a serious problem. (If Guillaume was correct in indicating that the open gallery had a roof with dormers, these would have to have been destroyed.) Then while the pavilion was being built, beginning probably in 1536 or 1537, Rosso may have seen that a closed gallery instead of a terrace could be added using the open one as its substructure. He had himself decorated the small Pavilion of Pomona that was situated just beyond the western end of that open gallery in a corner of what came to be called the Jardin des Pins. As the southern wing of the Basse Cour seems always to have been conceived as different from the northern wing, this may have been because it was always associated also with the large garden on its south side. It was, in fact, the south fronts of the château that became increasingly important at the château: the south front of the Gallery of Francis I, from which a south cabinet had been removed to make an unbroken south façade, and the south front of the Pavillon des Poêles, which overlooked the lake to the south and the garden that bordered it. What then would have been better than a long gallery overlooking that garden to provide a place with beautiful views for an inside promenade? Here Rosso, as Guillaume suggested, would have thought of the long gallery at the Vatican and would have proposed to the king a similar one to be set upon the south arcade. The project at hand, the Pavillon des Poêles, had to be finished and at least partially decorated to lodge the emperor Charles V when he visited Fontainebleau in December 1539. If the idea for the enclosed gallery had been decided on by that time it could have been begun. Guillaume believed that it was already built by then. But the new enclosed gallery and its link to the Pavillon des Poêles could have been built after Rosso’s death.3 The exterior of the gallery lacked the plastic articulation of the portico and exterior staircase in the Cour Ovale and of the Pavillon des Poêles, even on the garden side that could have had some relation to the south façade of the Pavillon des Poêles, so it is possible that what was actually built was not based on his design or on very extensive or detailed designs. Rosso may not have intended a vaulted or pseudo-vaulted gallery. 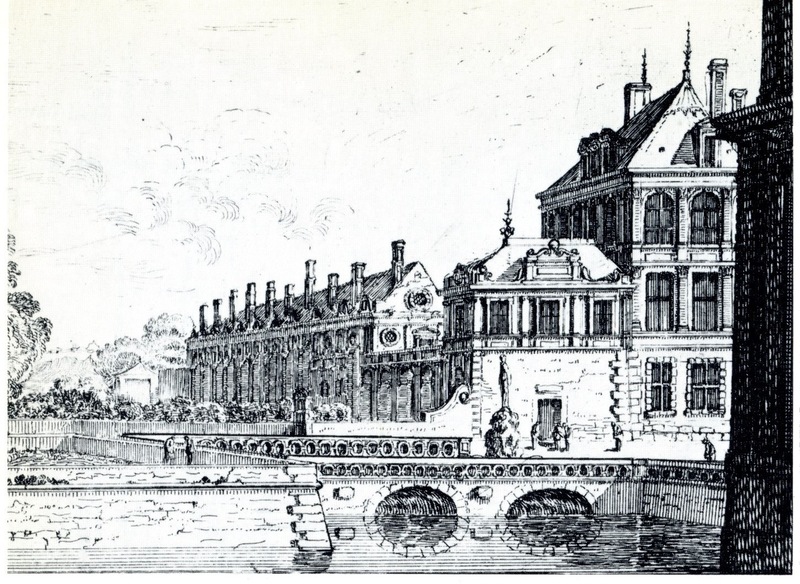 Guillaume’s architectural reconstruction, but not his attribution to Rosso, was reviewed by Mignon, 1988, 9-11, 15-17, who in general agreed with his conclusions. Mignon’s main interest was in determining a change in the east end of the gallery at the time that it became the Gallery of Ulysses around 1554-1556, when the easternmost small bay was turned into a vestibule by the addition of a partition wall between this small bay and the adjacent double bay. The façade of this vestibule appears in the views of Du Cerceau and Sylvestre and shows motifs derived from what appears on the south wall of the gallery. But the east façade appears less flat, perhaps to distinguish it. In Sylvestre’s view it also seems to show ovals instead of the round windows of the long sides of the gallery. It is the gallery that existed before the vestibule was created that would, then, have been the gallery to which Rosso’s name would be attached. It had sixteen bays, fourteen double and two small ones at the ends. It is not clear that it had the same façade that appears in Sylvestre’s print. Mignon believed that this was the gallery that was built for Francis I. 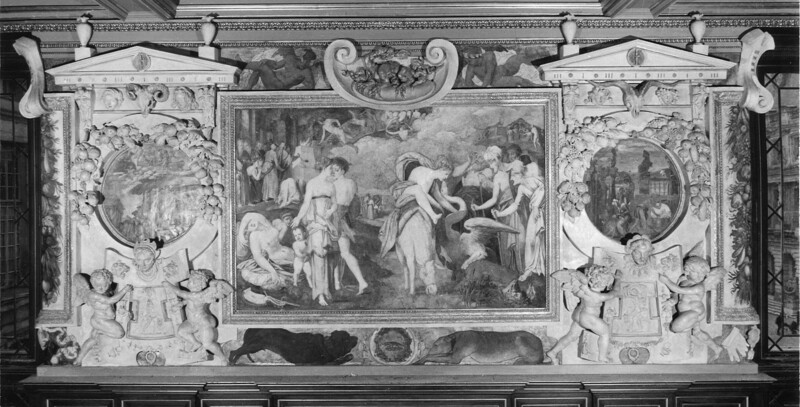 As the decorations that gave the Gallery of Ulysses its name were first begun in 1556, Mignon believed that there had been an earlier scheme of decoration of stuccoes, grotesques, and frescoed pictures in the manner of the Vatican Logge decorated by Raphael. The grotesques were by Fantuzzi and by others working from his cartoons. A payment to him for the frescoes and cartoons was made within the period of January 1, 1541 – September 30, 1550.4 Even at its earliest this period falls after Rosso’s death. 1 See Laborde, I, 1877, 67-68; Pressouyre, 1974, 28; and Béguin, Guillaume, Roy, 1985, 26-27. 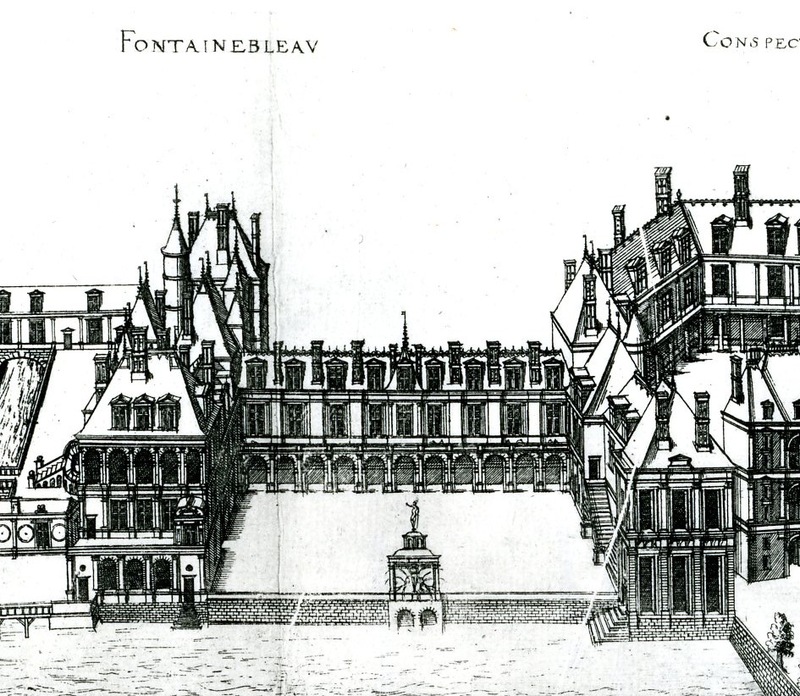 The project for the south wing is referred to in the document recording a payment made in 1535 as “galleries à jour en forme d’esquere estant au bout dudit corps d’hostel assis en la basse court de l’abbaye dudit Fontainebleau et ès appuis du jardin du château dudit lieu, dedans lequel y a une fontaine.” The gallery would be the one mentioned by Babelon, 1989, 200, as the long gallery or Gallery of Ulysses built in 1527-1531. 2 Guillaume does not show such windows in his reconstruction of the interior of this wall (Béguin, Guillaume, Roy, 1985, 51, Fig. 46 right). 3 In a document of 20 March 1538, Guillaume (in Guillaume and Grodecki, 1978, 45, 46, 49-50) interpreted the passage on the planting of vines “au long du pan de mur dud. cloz du costé des offices” as referring to the blank ground level wall of the Long Gallery, which would signify that the gallery was built by that time. But this “pan de mur” could also be the south wall of the first gallery that was built on the south side of the Basse Cour before the Long Gallery was built above it. 4 Laborde, I, 1877, 191-195, with payments to others for paintings and stucco work in the same gallery. Mignon, 1988, 16, 18, n. 46, Fig. 18, related these grotesques with Du Cerceau’s Livre de grotesques, as had Guillaume (Béguin, Guillaume, Roy, 1985, 45-47). These grotesques are not related to Rosso’s art. 5 Remard, 1820, commented that the destroyed Gallery of Ulysses was decorated by Rosso, Primaticcio, and Nicolò dell’Abate; it is not known what tradition indicated that Rosso was involved with this project.